This patch features a complete translation into Spanish. We used the Japanese game as a base, so the patch must be applied to the Japanese version of the game which is "Akumajou Dracula X - Gekka no Yasoukyoku" (J) (v1.2) [SLPM-86023] (545.440.560 bytes). 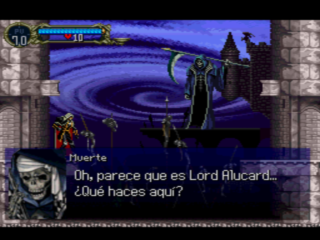 Many Spanish translation attemps have been conducted in the past, but now the game is 100% translated. As a curiosity, this translation is based on a previous translation conducted by Gemini, throughhim413 and Tom, and we used the same 8×8 and 8×12 fonts. Menu items use the 8×8 font and therefore it was not possible to include the capital "Ó". As a result, the words "Ónix" and "Ópalo" are in lower case. Also we added some dialogues that were in the Saturn version but were not present in the PSX version. 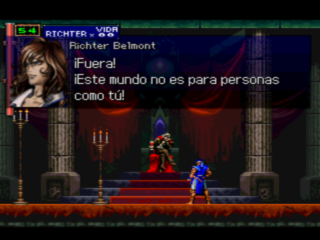 This game is usually considered the best Castlevania ever, so we hope you enjoy this translation as much as we do. It's been several months of hard work and testing and we are very proud of this job. Enjoy! Notice the panel is missing the golden border. I never noticed that glitch, I only focused on the translation. Besides I have no romhacking skills so I wouldn't know how to fix it. Anyways it doesn't look like a major glitch so I guess I'll leave it as it is. As a Latín American, I love so much news like that (even when I'm more used to play games on English ). Probably just a palette match error. If the graphics were reinserted with TileMolester, that's the issue. Hi Gemini, a few years ago I contacted you asking for help to make a translation in PT-BR, you said that you don't want to work in this game anymore. 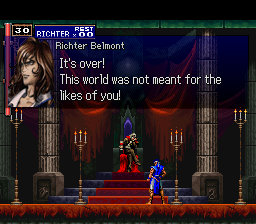 I'm no romhacker and I only made this translation because I am a super fan of Sotn, but I did not hide your work, every day I posted on the forum about the difficulties of not having your help, i had to sacrifice the "Y" to make the "Ô", i understand you (about your time) and I'm so grateful to you work, I also did not hide from the Green goblin but I'm not spanish and yet I did what I could to help him. We finally fixed the HUD error. Mis felicitaciones a los que lograron este gran trabajo. Gemini sorry about no mention in PT-BR Readme, I had to get out of the RHBR forum for personal reasons, and I did not posted the final patch version there, only in my youtube channel, someone posted the patch in other places, not me. I will release a another patch of SOTN soon and make it clear that it was done based on your translation, I will update the youtube descryption too. The patch consist in port the american version to japanese keeping the extras, is ready in PT-BR but I want to make in english too and Spanish with Green_goblin, so your translation will still yield results. Hi goblin, there's a patch here that remove up-down black bars, try check that, it's a very good version. No idea if that changes can be used to the normal us version. Unfortunatelly that patch is NTSC-U only. I wonder if this translation has the same "internal save data manager" jpn display bug as Gemini's. 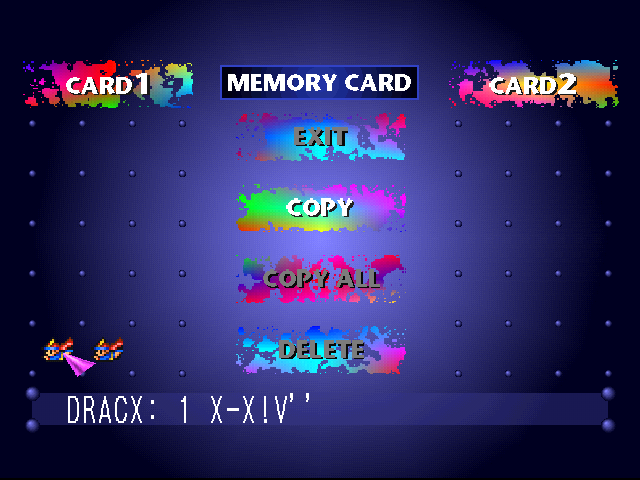 It seems Gemini patched the saving parameters from inside the game (ie: when creating a new save or using a save room), but hasn't patched the game's own memory card manager. The save with broken japanese in the pic was generated using the game's manager (using either the "Namechange" or "File copy" feature). At the "Select Your Destiny" window, select "Namechange", select any save and write any name. 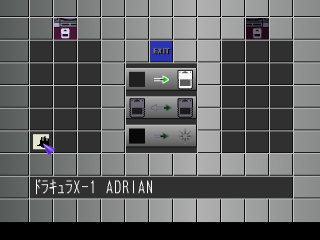 After the game has rewritten the save, check the save's new name in PS1/PS2/PSP memory card browser, you'll see broken japanese there instead of Gemini's translated save name. I just tried this and yes, it has the same problem. Anyways I don't think this is crucial. Indeed, very VERY far from it. I'll talk with Rafael (the romhacker of this game) and see if we can fix it. Another user found some minor errors in the patch and we will have to release a new patch anyways, so maybe we can fix the memory card problem. Nice, could you explain how you fixed the Memory Card bug? It'd be nice if Gemini's patch could be fixed as well. As you can see there are 6 Japanese characters. DRACUX would sound weird so Rafael decided to leave just DRACX.